We streamline market intelligence and create freight rate data standards allowing the industry to improve their performance. The data collected from Xeneta’s comprehensive user-base range from short to long term rate-agreements – all dependent on their procurement strategy. While some users have multiple rate-updates during a month, others has monthly, quarterly, annually or even two-year fixed agreements. Xeneta gathers several hundred thousand rates per month – a number growing on a monthly basis. Before releasing any market information, a minimum of 4 rates per route, per day, per equipment, is required. This is estimated as the weakest starting point, upon where Xeneta builds stronger benchmarks as additional rates are sourced. Mature trade routes (covered by extensive data-collection) are built up by several hundred valid rates per day – making the index reliable and accurate. The Xeneta Geo-Hierarchy is developed based on common market practices. Ocean freight rates contracted to/from specific areas/ports correlates strongly on price. We have used our database of millions of price points to validate the price correlation. We, therefore, offer global data coverage. We have grouped ports based on price and not proximity following the way the industry is pricing the different connections. Xeneta shows accurate pricing for the exact port-port connection as the rate data is aggregated based on ports with similar pricing. The areas where ocean freight rate correlation is strongest and embedded in today's quotation practices is in North Europe and the Far East. Therefore, in Xeneta, these are built up by Main Ports and Sub Ports. The remaining areas are built up by geographical areas. Through sampling, from a broad subset of companies, Xeneta collects data within a statistical sample to capture tendencies in the statistical population. Utilizing sampling requires a wide selection of sources, which is the basis of Xeneta’s services. The methodology is carefully chosen for quality assurance. Xeneta provides users with key statistical measurements of the market prices sourced. That way we provide you with easy to process information while at the same time ensuring the anonymity of our users' data. Our key metrics are 'Market Average' and 'Market low', which give immediate insight into price-trends in the market. The 'Market Average' is the arithmetic mean of all prices collected, showing you the average of all prices. The 'Market Low' is a 2.5% or a 5% mark of the Percent Point Function, which reveals the price point lower than 95% or 97.5% of all prices collected. No company specific rates or supplier names are disclosed/revealed between Xeneta users or published to the broader market. Through data-aggregation, Xeneta secures anonymity and neutrality for all involved stakeholders. Xeneta is, and will remain, a neutral party in the freight industry, meaning that no carriers, freight forwarders or NVOCCs can, or will, have an ownership stake in Xeneta. The sharing of information facilitated by Xeneta is in accordance with EU/EEA competition law. The market information supplied by Xeneta to shippers, freight forwarders and container ship operators, does not enable market operators to reduce competition between them. On the contrary, Xeneta provides transparency with respect to current and past prices that enables the operators, in particular customers, to understand the market price level and adapt more efficiently to the market – hence having a pro-competitive effect.The information made available by Xeneta is backward looking, aggregated, anonymized and accessible for customers and suppliers. The type of information exchanged, and the characteristics of the markets for liner shipping, prevents the operators to foresee strategic behavior of competitors, and does therefore not lead to collusive openings. Xeneta operates well within competition regulations, and its services assist in increasing the transparency of a very fragmented market, enabling buyers and sellers to make informed decisions. The system safeguards that neither individual prices, nor the identity of the members that uploads particular information, can be dissected. Xeneta does not enable customers to foresee the future market behavior of other individual users, but enables a more efficient adaption to market conditions. Definition of 'Sea Freight Rates' in Xeneta: The sea freight rates imported to the system are defined as the total ocean freight cost (port – port), including bunker adjustment factor (BAF), Currency Adjustment Factor (CAF), Canal surcharges and all other relevant surcharges within Xeneta’s port-port definition. 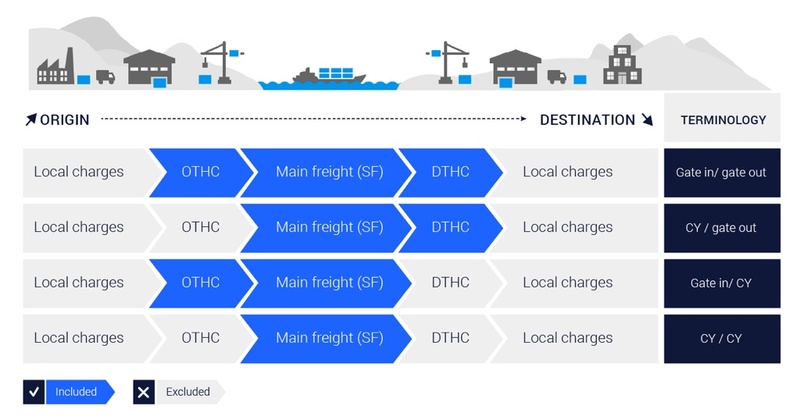 Terminal handling charges (OTHC/DTHC) are applied based on the Xeneta THC methodology. Data for 20’, 40’ and 40’ HC containers builds up the database – and the presentation of the data is segmented on these three container types. Data pertinent to special equipment such as Flat Rack, Platform, Tank or Open Top is excluded from the database. Xeneta source and collate rates on a port–port basis where the total container cost is built up according to the following structuring of surcharges.